WallCandy Arts designs and manufactures modern peel and stick decorating kits for the wall. Their wall decals are printed on art book quality presses utilizing the highest quality material in the industry. Removable and reusable, non-toxic, lead-free, VOC free and made in the USA. WallCandy is a family company owned and operated by moms. An Elephant that Wont Forget! 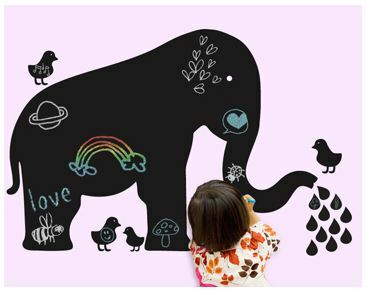 This removable, reusable elephant chalkboard especially helpful because it can migrate to wherever you need the most help remembering, without trampling the walls. Tweet this message: “Hope I win @WallCandyArts elephant chalkboard giveaway from ladyandtheblog.com (@verasweeney). RT to Enter #contest #giveaway”. Become a fan of LAB’s Facebook Page. Then leave a comment on the wall saying why you love the Wallcandy Arts elephant chalkboard giveaway. Fan WallCandy Arts on Facebook and mention that you entered the elephant chalkboard giveaway from ladyandtheblog.com. my daughter LOVES LOVES LOVES elephants. it would make her the happiest little girl in the world to have this on her wall!!! we entered the contest through the facebook posts. thanks!! Liked LAB’s Facebook Page and left a post. Kelly DoubleYou. Became a fan of Wallcandy Arts on facebook and posted a comment. Kelly DoubleYou. i left my email address! Commented under Easy Seafood Pasta recipe. This recipe looks so good. I’ve gotta try it. Fan of Wall Candy Arts on FB (Aileen) and commented that you sent me. I tweeted your giveaway. here is a link to my tweet. Posted on the Wallcandy FB page. I commented on your hair straightening post for an additional contest entry. Here’s a link to the page where my post is. More Bill and Vera please. I was laughing so hard, my 6 year old says to me, “What’s wrong with you mom”. Commented under Ideeli. Time to go check out their website. This would go perfectly in my son’s jungle room! I entered my info into your form. Thanks! I left my email on the contest entry form! I liked LAB’s Facebook page and wrote on the wall! I liked WallCandy Arts on Facebook and wrote on the wall! I signed up for LAB’s newsletter! This is the cutest thing Ive ever seen! I want one! I filled out the form for my first entry.